letting you surf anonymously preventing your IP or other information to be collected without your permission. 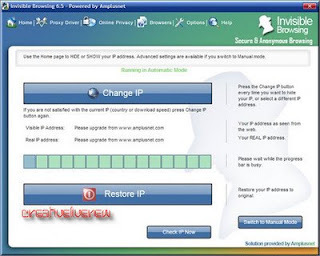 Invisible Browsing allows you to change your IP anytime by routing your Internet traffic through overseas servers. All proxies are tested in advanced providing a high speed anonymous Internet connection. Premium proxies are high quality proxies that will never slow down your Internet connection. Proxies followed by the tag "supports POST" allow dynamic Internet browsing and posting messages on various forums, message boards or vote in polls. Invisible Browsing is an efficient Internet Explorer Privacy Solution erasing automatically and in real time, all your online tracks. Invisible Browsing will hide, change or mask your IP address preventing others or any website from logging your internet address without your permission.